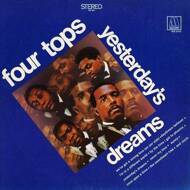 On Yesterday's Dreams, the Four Tops began looking back. Their songwriting and production mainstays, Holland-Dozier-Holland, had recently left the company in a royalties dispute and the LP included just one last song from the collective, "I'm in a Different World." Unfortunately, it was the biggest hit here, and nothing else compared to "Reach out, I'll Be There" or "Standing in the Shadows of Love."